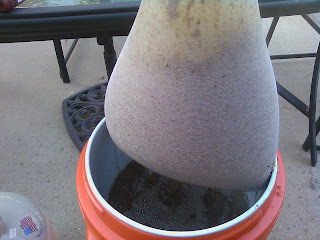 Seems like forever since I've brewed beer, but today I brewed up a batch of my world famous Phat & Tyred Amber Ale. 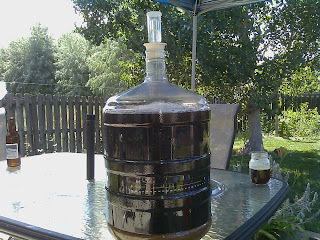 This is my first 5 gallon batch of the P&T beer. It is also the first time I've tried my modified BIAB process. 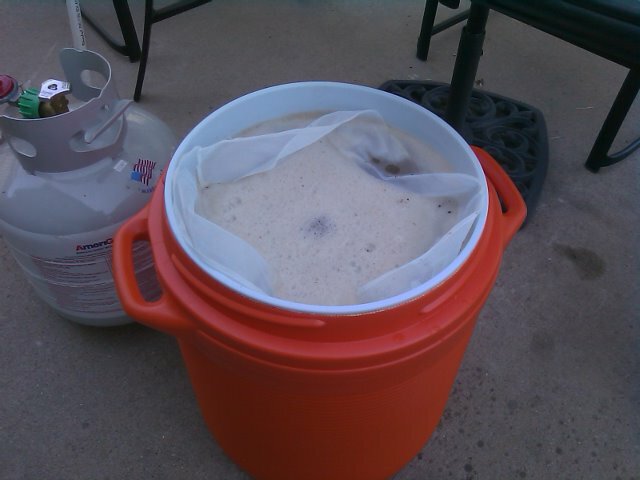 My modified BIAB process is basically using a nylon bag inside a 10 gallon gott cooler. 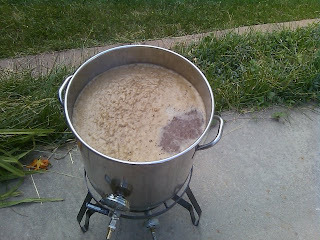 I used no sparge, and I got all my boil volume from the mash itself. Beer Smith gave me a strike water volume of almost 8 gallons at a temperature of 161F. Just in case you were wondering, 8 gallons of water is pretty heavy. 8 gallons of hot water is probably pretty dangerous, so if you are going to copy this process, you might want to be careful. I wasn't, but I'm not that bright. Plus, I lead a Semi Charmed Kind of Life, so I won't get hurt. You might. So, anyway, I heated up about 8 gallons of water to around 161F. Then, I drained the pot of water into my gott cooler which had a nylon bag full of grains inside it. 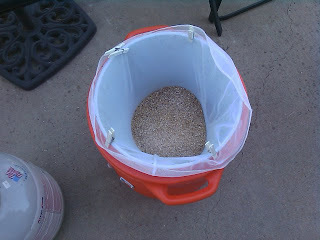 I had about 12.75lbs of grain and 32 quarts of water. The grist to water ratio was right around 2.5 quarts per pound, which is by far the thinnest mash I've ever done. This is certainly in the spirit of a BIAB. Initially, my mash temp was pretty low, but when I let the thermometer sit in the mash for about about 5 minutes with the top of the cooler on, I was at exactly 154. That was what I designed the recipe at, so that was good. A few minutes later, when I checked the temperature, it was at about 158, though. It actually took me awhile to stabilize the system at 154. 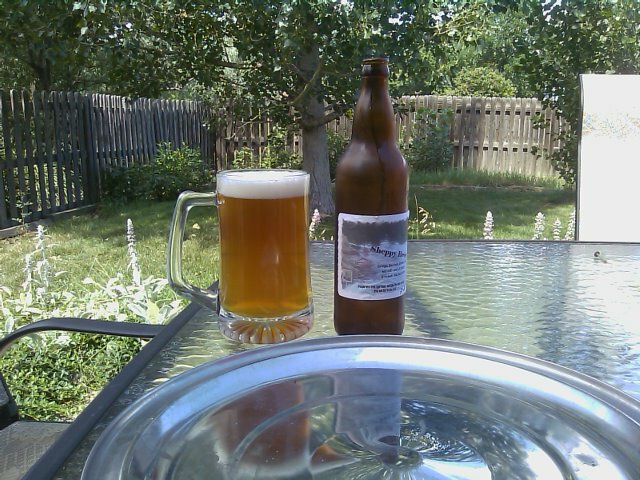 I am not sure I got the right temperature soon enough, so I might bet a more full-bodied beer than I had intended. But, that is ok. This is what the full mash looked like. I was able to mow my lawn during the mash. Multitasking is good. This much wet grain is actually pretty heavy. I seemed to get more grains in the wort than usual. I did not worry about it, though. The boil went as it should. I forgot to get the Fermcap-S out to thaw out a bit before I needed it, but I was able to just keep an eye on things and didn't get a boil-over. I used hop bags for all the additions except the very last one today. 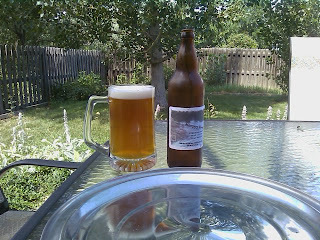 I am pretty certain that this is the hottest it has ever been for one of my outdoor brew days. It is certainly hotter than I've ever done a "big" batch with the wort chiller Tracy got me for my last birthday. 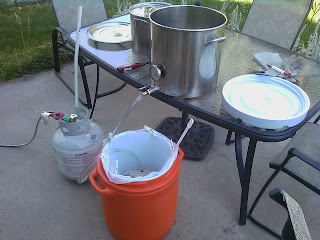 The wort chiller only got me into the upper 70's. 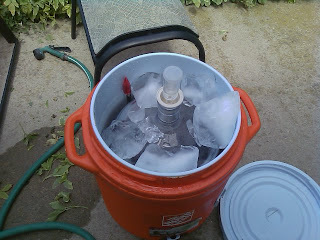 I filled the carboy and then put it inside the gott cooler with some ice. Used ice to cool down even more. It didn't take too long before the cooler water and the beer seemed to stabilize in the mid-60's. I pitched my starter, and shook it up to aerate the yeast. Then put the carboy back in the gott cooler to start fermentation. I think the system should be at about 60F. At the end, I had just about 6 gallons of wort at about 1.060 OG. Keep an eye on the comments on Phat and Tyred on the SheppyBrew website for an update on how it is going. I think it will turn out well.